Conversations with and features on CBTB's favorite crime fiction authors. 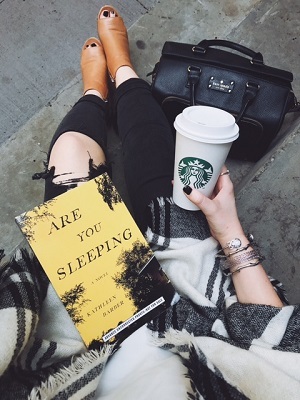 I’m absolutely thrilled to share a Q&A with Kathleen Barber, whose exceptional debut thriller ARE YOU SLEEPING released last week, and was an instant hit for me! ARE YOU SLEEPING is a seamless blend of podcast-inspired storytelling and a modern, on-trend psychological thriller. This book makes the perfect end-of-summer binge read! If you missed my review of ARE YOU SLEEPING, you can catch it here. 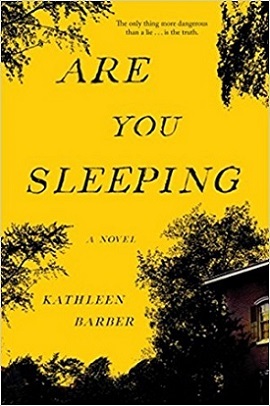 Read on for the book's plot summary and my conversation with Kathleen Barber, whose debut thriller ARE YOU SLEEPING is on sale now! The only thing more dangerous than a lie...is the truth. Josie Buhrman has spent the last ten years trying to escape her family’s reputation and with good reason. After her father's murder thirteen years prior, her mother ran away to join a cult and her twin sister Lanie, once Josie’s closest friend and confidant, betrayed her in an unimaginable way. Now, Josie has finally put down roots in New York, settling into domestic life with her partner Caleb, and that’s where she intends to stay. When investigative reporter Poppy Parnell sets off a media firestorm with a mega-hit podcast that reopens the long-closed case of Josie’s father’s murder, Josie’s world begins to unravel. 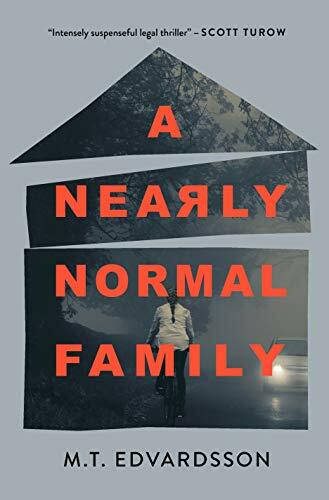 Meanwhile, the unexpected death of Josie’s long-absent mother forces her to return to her Midwestern hometown where she must confront the demons from her past—and the lies on which she has staked her future. Crime by the Book: First things first: congratulations on your debut thriller, Kathleen! I absolutely loved ARE YOU SLEEPING, and am just thrilled to have this Q&A up on Crime by the Book. Let’s start at the beginning -- what inspired you to write ARE YOU SLEEPING? Kathleen Barber: Thanks so much! I’m huge fan of your site, so I’m delighted to be included! I’ve actually been writing drafts about ARE YOU SLEEPING’s protagonist Josie and her twin sister Lanie for years—but I didn’t find the story I thought they deserved until I started listening to the “Serial.” I got hooked during the first season—the one investigating the 1999 murder of Baltimore high school student Hae Min Lee. I spent a huge amount of time that fall thinking, reading, and talking about not only the podcast but about the underlying case. I was so invested in the podcast that I almost forgot it wasn’t just telling an interesting story—it was describing a very real tragedy that had happened to some very real people. That realization really inspired me to think about what it’s like to be on the other side of a popular case like this—one where the incident has crossed over from the realm of criminal justice to that of pop culture. CBTB: If you could describe ARE YOU SLEEPING in three adjectives, which adjectives would you choose? KB: This is such a hard question! Tangled, exposed, tense. CBTB: I’m an avid listener of true crime podcasts, so naturally my personal favorite element of this book is the homage it pays to those shows! ARE YOU SLEEPING flips the script on true crime podcasts, focusing on the podcast’s subject rather than the podcast’s host. Could you share a bit about this decision? Why not write a psychological thriller focused on the podcast host? KB: My decision to write from this perspective had a lot to do with how I myself consumed “Serial.” When I was listening to the podcast and reading about the underlying case, I spent a lot of time hanging out in corners of the internet where armchair sleuths gather—places like the dedicated subreddit and other forums. Reading so many theories about the case and its participants, almost all of which were extended by casual podcast listeners with no investigative training, made me think about how this constant discussion would affect the people involved in the case—or any case that drew a lot of media attention. I imagined it would feel really invasive, and I wanted to explore that in the characters. Poppy Parnell, the podcast’s host, has her own story, but it wasn’t the one I wanted to tell at this point. CBTB: Speaking of podcast hosts: your fictional podcast host Poppy Parnell seems so lifelike—I could practically hear her voice in my head while I read the “transcripts” of her show. Are you a podcast listener yourself? Was it a love of podcasts that prompted you to incorporate this element into your thriller? KB: Strangely enough, when I started writing ARE YOU SLEEPING, the only podcast I had listened to was “Serial.” Before “Serial,” I didn’t really get podcasts. I’m a very visual person, and I couldn’t figure out the appeal of audio-only mediums—I didn’t listen to audiobooks, either! I couldn’t figure out when I was supposed to be listening to podcasts, either. I was puzzled by the whole thing. But my brother kept suggesting “Serial” to me, and so I finally gave it a try ... and I was hooked. I realized my earlier question about the when answered itself—I could listen to podcasts while exercising, while transiting from place to place, while cooking, even while showering if I turned the volume up loud enough! Now I’m a big fan of podcasts—I use an app to organize the ones I like to listen to, and even write myself notes if there’s an episode of something I want to listen to. CBTB: On that topic: were there any particular podcasts that you listened to for inspiration while writing ARE YOU SLEEPING? KB: I didn’t listen to anything while I was writing—when I’m writing, it’s hard for me to consume anything other than, say, The Great British Baking Show. But most things that have a storyline are difficult for me to consume while I’m writing because the stories will worm their way too deeply into my skull, and then they’ll get mixed up with the stories I’m trying to tell. Once the first draft is done, however, other people’s stories are safe again for me—and so during the editing process I listened to a bunch of different podcasts, particularly true crime podcasts. As I mentioned, I wasn’t much of a podcast listener before I started ARE YOU SLEEPING, so I felt like I had a lot of catching up to do in order to make the book’s podcast feel lifelike. I listened to so, so many, but my favorites (other than “Serial,” obviously) were “The Generation Why Podcast,” and “Missing Maura Murray.” I love how “Generation Why” tackles a different subject in each episode, and I’m hooked on “Missing Maura Murray” because her disappearance is such a puzzle. CBTB: As previously mentioned, this is your debut novel! (Congratulations again!) Have you always aspired to novel writing? KB: Yes, always! As a kid, I used to drag around this electric typewriter—I’m sure I’m dating myself by admitting that I started writing before home computers were common—and write what amounted to The Babysitters Club fanfiction on it. I’ve never been able to not write—my class notes always had ideas for stories or snippets of dialogue scrawled in the margins, and even when I was working as a lawyer, I’d sometimes have to turn off my billing timer and scribble out a scene on a piece of scratch paper. Having a published novel has been a dream I’ve had for literally as long as I can remember, and so it feels so incredibly surreal to have ARE YOU SLEEPING out there in the world! CBTB: Are you a crime fiction reader as well as writer? If so, what are a few of your most-recommended crime reads? If you’re not a crime reader, what’s your genre of choice? KB: I read across all genres, but I do have a special place in my heart for crime fiction! My most-recommended read is ALL THE MISSING GIRLS by Megan Miranda (I love the reverse timeline! ), and I’ve spent a lot of time this summer talking about both THE LYING GAME by Ruth Ware (I love all her books, but this one was my favorite—I stayed up all night one night to binge on it!) and UNRAVELING OLIVER by Liz Nugent (this one is so disturbing, in the best way). KB: It’s still kind of early days, so I don’t know how much I should say (things can change so much with a work-in-progress! ), but I’m definitely working on something! Thank you very much to Kathleen for taking the time to answer my questions so thoughtfully, and to her publisher for facilitating this Q&A! I'm thrilled to be able to share it with CBTB readers today.